Box Text: The full-court action between the Arch Rivals is really hot tonight. Here's Mohawk taking it to the hoop...POW! He just got nailed in the alley with a right cross! FOUL! FOUL! FOUL! That's Right. No Fouls. This is basketball where breaking the rules is part of the rules! If you can't block a shot - knock your opponent's block off. If you can't steal the ball - steal his shorts! But don't think these tactics are enough to win. 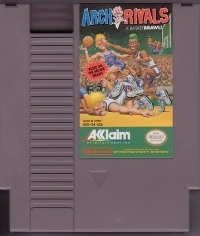 Arch Rivals still requires real B-ball skills like passing, shooting, ball handling, slam dunks, and 3 point shots. 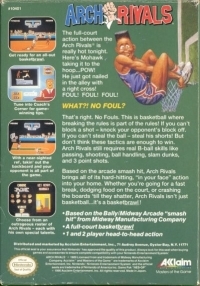 Based on the arcade smash hit, Arch Rivals brings all of the its hard-hitting, "in your face" action into your home. 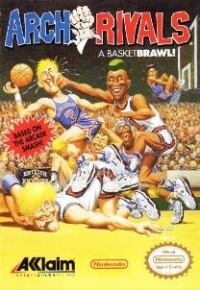 Whether you're going for a fast break, dodging food on the court, or crashing the boards 'till they shatter, Arch Rivals isn't just basketball... it's basketbrawl! This is a list of VGCollect users who have Arch Rivals in their Collection. This is a list of VGCollect users who have Arch Rivals in their Sell List. This is a list of VGCollect users who have Arch Rivals in their Wish List.